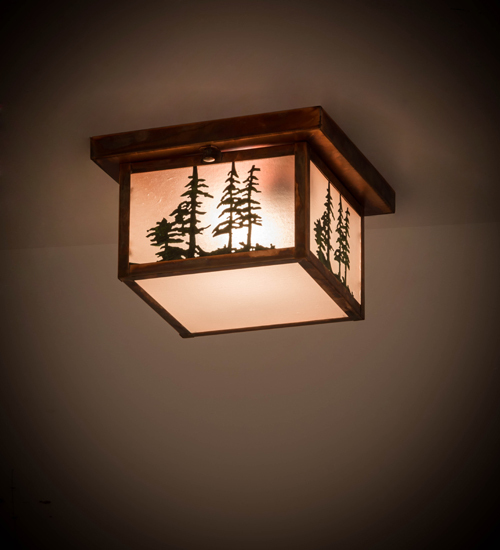 Description: A nature inspired design of Tall Pine trees is depicted as the late afternoon sun shines over the American woodlands in this custom crafted Solid Brass ceiling fixture. The flat roof and straight line design are inspired by the Mission movement depicted on this handsome American-made Craftsman Signature style, which comes to light through a Clear Seeded Glass shade with a Satin Finish and enhanced with a matching bottom diffuser. Hardware is featured in a Vintage Copper finish and complemented with Trees handpainted in Verdigris finish. Handcrafted in the Yorkville, NY manufacturing facility. This distinctive luminaire is available in custom colors, styles and sizes, as well as dimmable energy efficient lamping options. UL and cUL listed.